I just wanted you all to know, that I will be taking a break from the net. I’ve been experiencing the most horrible pain. I think it’s time to find a new doctor, who can truly figure out what is going on. If this is just Chronic Pain Syndrome, and Severe Fibromyalgia, then I will accept that. For some strange reason I feel there is more to the pain I am experiencing. 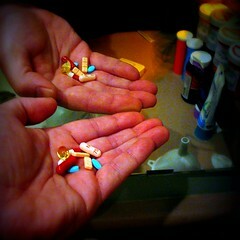 I refuse to take the meds. My kidneys will not keep handling them well. I don’t want all you wonderful people to wonder what happened to me. I can’t keep staying up till all hours of the night, unable to sleep, because the pain is so severe. I promise to be back, but I have to re-group myself at this time. Much love to you all!